By 5pm on December 24, Washington’s office doors have long clicked shut. Reagan National Airport begins to recover from the overflows of members of Congress and their staff who have fled town. Many expats will be gone. One cadre of Washington residents will spend the holidays here because home is somewhere around the globe (and a plane ticket is not in their personal economic recovery plan). But for many more of us, here’s no place we’d rather be. We love the quiet of holiday streets emptied of the masses, our nation’s Capitol bathed in winter light. Perhaps Christmas Eve is just another day. Yet, there is an undeniable celebratory twinkle in the air. Rather than press a virtual nose against the glass while forking cold takeout from a cardboard container, savvy Christmas “orphans” plan a celebration with their Framily—the friends they love, the family they choose—and together they make a new tradition. While some of those gatherings include a meal from a home kitchen, many opt to spend the holiday at festive restaurant tables. Around the city, there are spectacular options for holiday meals. French bistro Le Diplomate offers a Christmas Eve menu. On the 23rd, DGS Deli repeats the Chinese-Jewish deli mashup with guest chefs from around the city. And Osteria Morini Pastry Chef Alex Levin serves sufganiyot for Hanukkah. Since 2011, Chef Fabio Trabocchi has served up “an indulgence menu” based on the traditional Feast of the Seven Fishes at his downtown restaurant Fiola, recently awarded one Michelin star. The Feast is also served at Casa Luca and Fiola Mare. The meal reflects Trabocchi’s native Italy, where there is a long tradition of a seafood feast on Christmas Eve and, in his case, seafood on the table every holiday. As a young chef in Italy, Trabocchi might have enjoyed these meals in restaurants, but it is infinitely more common to feast with family and that is the spirit with which he infuses his menu. It’s celebratory, beautiful and filled with opportunities to dazzle. The first year, Chef Trabocchi’s menu honored each of the seven fish, but diners cried “uncle!” too soon, leaving some food languishing. The following year, he reworked the menu to express the seven in five exquisite dishes. 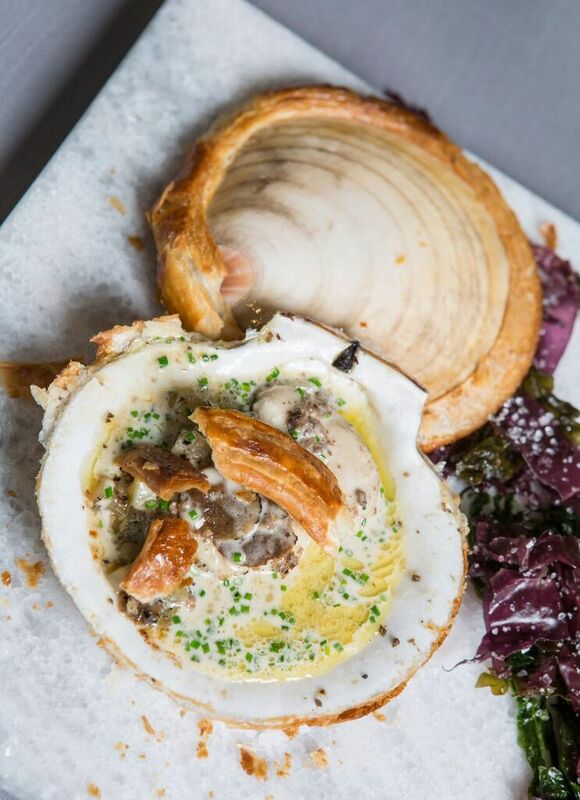 From the briny oysters served atop a perforated ceramic tower, to a plump Maine scallop nestled in a puff pastry shell topped with a perfect disc of black truffle, to the buttery seared foie gras and lobster poached in Barolo, every element feels like a gift. EDC had a chance to preview Fiola’s 2016 Feast of the Seven Fishes menu. If you can’t get your Framily there this year (reservations fill up quickly), here are four recipes to add to your own holiday table.